Payman Taei is the founder of Visme and HindSite Interactive. In late 2001 he started creating websites for businesses to pay his way through college. With $170 and a vintage Pentium processor in the corner of a small apartment, over the last 14 years he grew HindSite to a stable award winning web consulting company with two profitable divisions; a web consulting firm and a Software as a Service (Visme) which allows 250,000 businesses and individuals to create professional presentation and infographics right in their browser. 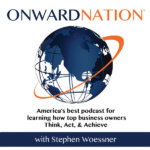 Click to tweet: Payman Taei shares his outstanding experience and insights on Onward Nation! Payman has a daily task/goal list to stay focused – be productive every day. ONWARD! Be consistent – Payman sees success by keeping clear, consistent goals in sight. Payman’s nine-month developed product wasn’t being used – and Payman tells the whole story here. I would have listened to my instincts – be grounded. Listen to your customers – but know when to say no. An individual is in line without vision – and is passionate about our business.